Photo: Simeon B. Robbins House, ca. 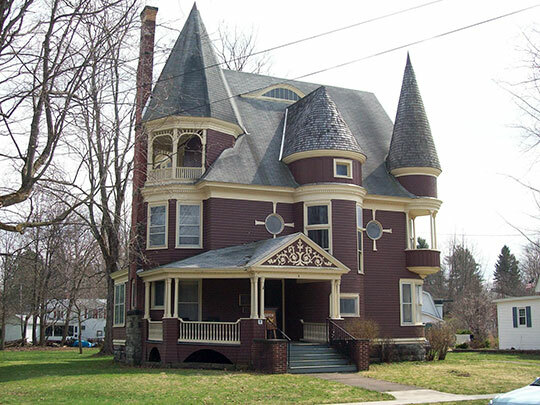 1895, 9 Pine Street, Franklinville, NY. Listed on the National Register of Historic Places in 2003. Photographed by User:	Pubdog (own work), 2010, [cc-by-1.0 (creativecommons.org/publicdomain/zero/1.0/deed.en)], via Wikimedia Commons, accessed July, 2015. County administrative offices are located at 303 Court Street, Little Valley, NY 14755; phone: 716-938-2577. The first white settlement in the county was made as a result of a mission to teach Indians of the section by Quakers of Philadelphia. Joel Swane, Halliday Jackson and Henry Simmons were sent by the Friends, in 1798, to locate among the Senecas, which they did in the present town of South Valley. They tried to teach the Indians agriculture, and it is an interesting fact that they offered premiums for the growing of fine crops forty years before there were any such prizes given among whites. Cattaraugus County, was formed in 1808 from Genesee County and named "Town of Olean." Under the act of its formation, Cattaraugus County was provisionally annexed to Niagara County until there were 500 taxable residents qualified to vote for members of the NY Assembly. In 1812, for judicial purposes and convenience of the inhabitants, the eastern portion of the County was annexed to Allegany County. Acquiring in 1817 the required number of taxable inhabitants qualified to vote, Cattaraugus County was chartered as it is today. The first court house and jail were built in Ellicottville in 1817-18, with the courts and county business being conducted there until 1868 when the County seat was moved to Little Valley. The original court house, designated by state and federal agencies as an historical site, has been restored following a 1969 fire, and is now used for Town and Village of Ellicottville offices. Cattaraugus County Department of Economic Development, Planning & Tourism, Self Portrait of Cattaraugus County, 5th Revision, Little Valley, 2002; www.cattco.org, accessed June 2009.